Reading through Peter’s first Epistle, we tend to look for deeper things and fail to see the simple teaching that is found in the repeated little word “as”, that is used to describe the people of God as strangers and pilgrims in the earth. They have been “begotten unto a lively (living) hope through the resurrection of Jesus Christ from the dead” and rejoiced in “an inheritance incorruptible and undefiled and that fadeth not away reserved in heaven for you who are kept by the power of God through faith.” They were going through seasons of heaviness described as “the trial of your faith,” that will bring its reward “at the appearing of Jesus Christ”. They had not seen Him, but they loved Him and “rejoiced with joy unspeakable and full of glory”. This rejoicing in the inheritance, in love to Christ and joy in Him is seen as their normal spiritual experience. This should be our continued experience as believers in our day. This expression comes in the section that deals with the great truth of being redeemed with the precious blood of Christ. He was “As… a Lamb without blemish and without spot, who was foreordained before the foundation of the world, but was manifest in these last times for you.” We too have been redeemed by His precious blood. In Exodus 12 Israel had a beginning of days with God through the blood of the passover lamb which was applied to the side posts and upper door post of the houses. The blood made them safe, and they fed on the roast lamb ready to begin their journey from Egypt to Canaan. Without the precious blood of Christ, we would not have this heavenly hope. “As obedient children not fashioning yourselves according to your former lusts in your ignorance, but as He that has called you is holy, so be ye holy in all manner of conversation because it is written, Be ye holy for I am holy” God’s “holy people” are so named at least five times in Leviticus to show their distinctive character in contrast to the other nations. Clean food is the subject in Leviticus 11:45, but the exhortation “to be holy as the Lord is holy” is repeated in chapters that warm of immoral practices, the reverence of God’s sanctuary and discernment between holy and profane and clean and unclean. Israel came to Sinai in the third month after leaving Egypt and the Lord’s message was clear, “Now therefore, if ye will obey My voice indeed…then ye shall be a peculiar treasure unto Me above all people” (Exod 19:4-6). Through Jeremiah, the Lord told them, “Obey my voice and I will be your God.” (7:21-24). We can do no better than to quote 1 Samuel 15:22-23, “Hath the Lord as great delight in sacrifice and offering…as in obeying the voice of the Lord? Behold to obey is better than sacrifice and to hearken than the fat of rams. For rebellion is as the sin of witchcraft and stubbornness as iniquity and idolatry.” King Saul had been told to completely destroy Amalek (type of the flesh), but he kept the best to offer to God. Because of doing this, he was rejected as king. God’s estimate of flesh was the same then as when Paul wrote, that “no flesh shall glory in His presence” (1 Cor 1:29). 1 Peter 2 tells us of the manifestations of the flesh that have to be laid aside before, “As newborn babes we desire the sincere milk of the Word to grow thereby.” “All malice…all guile, hypocrisies…envies and all evil speakings” (v 1). Paul warns us that the Spirit of God is grieved because of these evils, and as He alone guides into the truth of the Word, if He is grieved there will be no spiritual growth (Eph 4:24). The Corinthians were spiritual babes because of their carnal state of envy and strife (1 Cor 3:1). John Bunyan wrote, “A new born child cries; and if there is no voice, we fear that it is dead…It is natural for a child to ..it desires food…so the new born babe desires the sincere milk of the Word that he may grow thereby, there is no satisfaction till you get the milk of God’s Word into your soul.” He wrote that those who have no appetite for the Word might well be lifeless professors. How is our appetite for God’s pure Word? This teaches us the outcome of spiritual growth and shows that as believers we have come to the “disallowed stone, yet chosen of God and precious. Ye also as lively (living) stones are built up a spiritual house, a holy priesthood to offer spiritual sacrifices, acceptable to God by Jesus Christ.”Are we losing the truth of the assembly as a spiritual house and that worship acceptable to God must be by the enabling power of the Spirit of God? We need to search our hearts because we are in danger of a light, casual approach to divine things that leads to charismatic excitement. Let us hear afresh the Lord’s words, “The true worshippers shall worship the Father in spirit and in truth… God is a Spirit: and they that worship Him must worship Him in spirit and in truth”? Growing spiritually will enable us to rise to the priestly exercise of giving God His portion in worship. Royal priesthood in service will follow (v 9). “Dearly beloved, I beseech you as strangers and pilgrims, abstain from fleshly lusts which war against the soul.” Hebrews 11:13 refers to those who “confessed that they were strangers and pilgrims on the earth.” “Having your conversation honest among the Gentiles, that, whereas they speak against you as evildoers, they may by your good works, which they shall behold, glorify God in the day of visitation’ (v 12) The life of the stranger and pilgrim should be such that it puts to silence those who oppose and speak against them. Verses 13-15 see them as law-abiding citizens submitting to civil authorities; “Whether it be to the king, as supreme; or unto governors, as unto them that are sent by him for the punishment of evil doers, and for the praise of them that do well. For so is the will of God, that with well doing ye may put to silence the ignorance of foolish men.” When we so live, our testimony compels men to ask, “a reason of the hope that is in you” (1 Pet 3:15), and like the patriarchs, we will be confessing “that we are strangers and pilgrims in the earth” (Hebrews 11:13). “As free, and not using your liberty as a cloak of maliciousness, but as the servant of God.” “For brethren, ye have been called unto liberty …only use not liberty for an occasion to the flesh, but by love serve one another” (Gal 5:13). Freedom to serve God and liberty to serve one another is seen in both these passages. 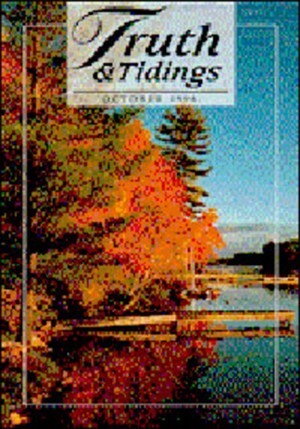 “If ye bite and devour one another, take heed that ye be not consumed one of another” (v 14). This is a strong warning. Can it be possible that we could become spiritual cannibals? We are not to use our liberty in this way. From verses 21 to 25, we have a beautiful presentation of Christ as the Perfect Servant, as an example to follow His steps. Isaiah 53:9 is before us as to His sinless life, “Who did no sin, neither was guile found in His mouth”, and Peter writes so tenderly of His sacrifice, “Who His own self bare our sins…and by His stripes ye were healed” (Isa 53:5,12). Again, “Ye were as sheep going astray” is a brief quotation from Isaiah 53:6. To think that we were lost sheep going astray and that He sought and found us, and now in resurrection, “He is the Shepherd and bishop (overseer) of our souls,” as He watches over us in watchful care in the pathway to glory This should move our hearts to praise indeed, when we remember that as the good Shepherd He gives eternal security and never loses a sheep (John 17:12).